Listen to your favorite music everywhere. Music enhances the ambience in your home, from a Saturday night party to a tranquil Sunday morning. With a music server and whole house audio system, Senseworks will help you re-connect with the music you love. Our designs enable everyone in your home to spend more time listening to their favorite music. Easily navigate through albums, playlists, and radio stations using intuitive remotes and touchscreens. Create your own listening experience in any room - even outdoors. What exactly is a music server? A music server is simply an audio/video component just like a CD Player or a DVD Player. It contains a hard drive and processor to store and catalog all of your music, eliminating the need for CDs. You just load all of your CDs onto the music server one time, it finds the song information, artist information, album artwork, and that's it. Why can't I just use my PC as a music server? You can, with applications such as iTunes®, Windows Media Player®, and Real Player®. This is perfect for listening to music using PC speakers or local speakers in the same room as the PC. But for whole-house distributed audio systems, Senseworks feels that using a dedicated music server has several significant advantages over using your PC. 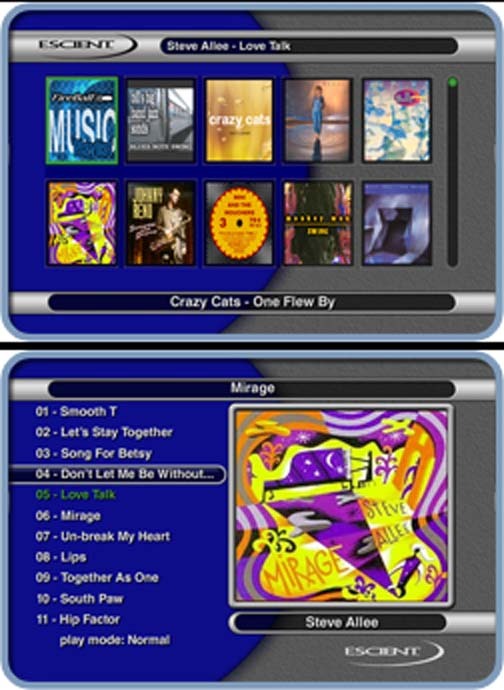 USER INTERFACE - Music servers have a video interface that can be sent to any TV in your house so that you can use remote controls to browse through your CD collection or choose to listen to web radio stations in any room! Music servers allow you to browse and select your music in the same way that you browse and select saved television programs and movies with a DVR or TiVo® system. ACCESSIBILITY - Music servers connect to your home network and become an extra hard drive that's accessible from any PC on the network so all of your music resides in a dedicated central location. You can still use iTunes® or other applications to catalog and play the music via PCs. You can still synchronize your iPod® like you always have. The music server gives you all of this capability plus the ability to browse and play music anywhere in your house. STABILITY - Music servers use stable dedicated operating systems. You don't have to worry about crashes, virus attacks, or freeze-ups. SOUND QUALITY - The music server is a dedicated hard drive for all of your music. Depending on the size of your collection, you can store all or most of your music as uncompressed audio files for maximum sound quality and enjoyment.